When I first started bass fishing, I wanted to take a trip down to Florida for a shot at catching a 10 lb. Bass. After calling several different guide services, I came across Hugh Crumpler’s guide service. One of the first things he said was “I hope you don’t mind getting hung up on branches”. He then went on to explain all about Stick Marsh (Farm 13). Stick Marsh was an old orange grove with canals running through it for irrigation purposes. The canals were damned, allowing the orange grove to flood. Almost the entire water column was infested with branches from top to bottom. The canals already supported a healthy population of bass, which quickly took to the newly available cover. In addition to the population of resident bass, Florida’s D.E.P. (Department of Environmental Protection) stocked it with hatchery bass. Here is the amazing part; according to the D.E.P. 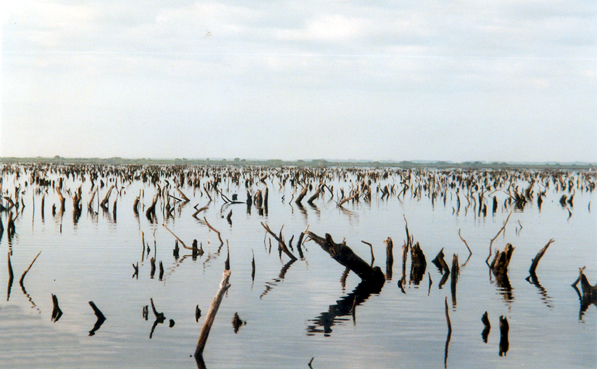 Stick Marsh has a two-pound per year growth rate. Within the first two years, the “average” fish had grown to over 5 lbs, and there were lunkers ranging from 8 lbs –14 lbs caught in numbers, every day! This sounded too good to be true and although I was skeptical, I had to check this place out. If you made an average cast in an orange grove, your line would cross about seven trees. Now, if there is a bass on the end of that line, think about how many branches he can get tangled in, on the way back to the boat. It makes for some pretty challenging fishing and what a RUSH! I must have lost close to 30 bass, including a MONSTER that tangled in a branch right at the side of the boat and pulled the hook out. I still managed to land over 20 bass between 4 – 6 lbs and some great video footage, including the monster beside the boat. So, what was the point of all this? When I got back to New York, my outlook on bass fishing had completely changed. Instead of just picking apart the edges of cover, I’d throw into, onto, under, over and any place I could get my lure into… I even threw into places that I thought I couldn’t get my lure into. I did this at first, because it was much more challenging to get a fish of out heavy cover. Now I do it because I have caught a lot of really big bass casting into the heaviest cover I can find. Most fishermen know that big bass like heavy cover, near deep water, with an abundance of food nearby. What they don’t know is that the really big bass will “claim” the heaviest piece of cover in that given area. If a big bass is caught and removed from a piece of cover and there are other big fish in the area, it won’t be long before another big bass occupies that same piece of cover. On several occasions, I have witnessed fishermen catch a big bass from a piece of heavy cover, put it in the live well and leave without making another cast. Then a short while later see a different fisherman come by and catch another big fish from the same spot. It’s not uncommon to catch more than one big bass off the same piece of cover. In fact I have had days where both my partner and I have caught several fish off the same piece of cover and even taken back-to-back lunkers. I try to make a habit out of returning to cover that I have taken fish from earlier that day. There is usually a good reason those fish were there. I know what you’re thinking, this all sounds great, but what about when you’re fishing a tournament and every area has a ton of boats fishing every piece of cover in site? Well, since most of those guys are going to target the easier places to cast, that sure leaves a lot of untouched water for those willing to get in there and take a chance. So with that said, how many times have you made a cast “over” a dock in a tournament? How about between a boat, a dock and over the ropes that are keeping them together? How about casting over a tree and some bushes so your line is hanging from a branch that is seven feet off the surface of the water? Sound crazy? It is, but you have nothing to lose. What’s the worst thing that could happen? You lose a lure, or even worse, you lose a big fish… SO WHAT! If you stick a big fish and lose it, she probably won’t hit again that day. Think of it this way, for every fish you lose, that’s one less fish your competition has a chance of catching. Obviously we don’t go fishing to lose fish, so we have to stack the odds in our favor, so let’s talk about equipment. This is not the place to be using 6 lb test line, a 5’ 6” rod and that old push button reel that your granddad left you in his will. You should be using at least a 7’, heavy power rod, with a minimum of 20 lb test (Mono or fluorocarbon) line or 55 lb test braided line and a heavy-duty casting reel with heavy drag. A quality reel will also make skipping easier with a baitcasting setup. I spent a lot of time and money trying different rod, reel and line combos for this task. I personally like a one piece, 7’ St. Croix Avid Series, heavy power, fast action rod, with a Shimano Curado reel and 20 LB Berkley Big Game mono. I can flip, pitch, cast and skip a jig almost anywhere without the hassles of backlashing and constantly having to play around with my reel settings. Lure selection… I almost always use a 3/16 oz. or 5/16 oz. black/blue Stanley jig tipped with Strike King’s Sr. Bo-Hawg pork. You’d be amazed at some of the places you can pull big bass out of with this type of setup. If you’re seriously considering trying this method of fishing, your casting skills must be above average. For newcomers, practice casting around obstacles in your yard when you’re not on the water. You’ll want to be as proficient as possible when you get out there. Aside from that, all it takes is some creative thinking, versatility and sometimes a little luck to get into some of these places. 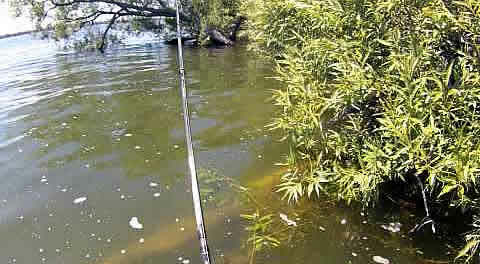 Although this method of fishing is a bit unconventional and extremely tuff on tackle, when mastered, it can be deadly. Man made swamps, every county has a few. Rivers and streams that have been dammed in one spot or another; creating a pool of water for industry, drinking or even recreation. These areas area usually shallow with a deeper spot by the dam, when I say deeper, I mean only around 5 to 6 feet. Fish such as Largemouth Bass love these areas, and some of the swamps can produce pretty sizeable fish. The trick is finding which one to fish and what lures to throw to entice them to bite. October thru March in the upper Midwest usually means that bass season is pretty much over, most folks take their bass boats in for their end of the season maintenance and winterization and start focusing on deer and waterfowl season. Hey what do you expect it’s the North Country; the first major snow storm comes in and you’re stuck at home watching fishing shows and going in & out of Bass Pro Shops or your favorite tackle store just to keep that desire for April spring fishing on your mind. This step by step instructional guide will break down the different components that are used to make a drop shot rig and explain why, when and where you would use them. The drop shot is a rig that every bass fisherman should know how to tie and fish. It is truly one of the greatest fishing techniques ever invented. There are many different ways to make a drop shot rig. If you are not familiar with drop shotting, the basic concept is to allow you to suspend a soft plastic lure while maintaining contact with the bottom. Spinnerbaits & Buzzbaits: Where, When and How !